If you want to maximize happiness and cultivate more inner peace, expect less. As a teenager, I was stoked to watch An American Werewolf in Paris. I just knew it was going to be edgy and scary—a cinematic masterpiece! What it was, however, was a gigantic let down. It was a terrible movie. Fast forward a couple years, and said movie was on TV. I agreed to watch it with some friends despite knowing how much it sucked. Imagine my surprise when the credits rolled, and I realized that I didn’t hate it. In fact, I had rather enjoyed it the second go round. Same movie, polar opposite reactions to it. What accounted for the difference? That experience was one of the first that really hit home to me the power of expectations. Expectations are internally constructed rules and demands for the future—our whats and hows about upcoming situations, events, even people. Notice the language: internally constructed. Our brains create expectations, these powerfully adhered to artifacts of imagination; they are not tangible facets of reality or valid parts of our external world. Sure, some expectations are mutually agreed upon and accepted by a large number of society (I expect people to wear pants in public, and I venture that you hold the same expectation). Others, however, are more unique to us as individual expectors, based on our histories, personalities, thought patterns, and wants. Unmet expectations, as in my silly movie example, are frequently the source of angst. Think of your most saddening, maddening, or frightening experiences recently. Think of the times when you felt anything but happy. Were unmet expectations, on your part or someone else’s, at the core of the issue? A pessimist dressed in a realist’s clothing may say “expect less to avoid disappointment.” Set that bar low. Things either turn out just the way you expected, or you’re pleasantly surprised. I agree with “expect less,” though in a different way. Expect less. As in expect less frequently. Set fewer expectations period. Don’t set the bar lower, but rather, don’t set the bar at all. It is the bar itself, not its location, that’s the problem. More precisely, it’s the mismatch of the bar and reality that robs us of happiness. So much of what happens around us and to us is, at least in part, out of our direct control. Yet, we strive to control it anyway. These efforts give the illusion of control but really just take time and energy, keeping us from being fully authentic in the moment. 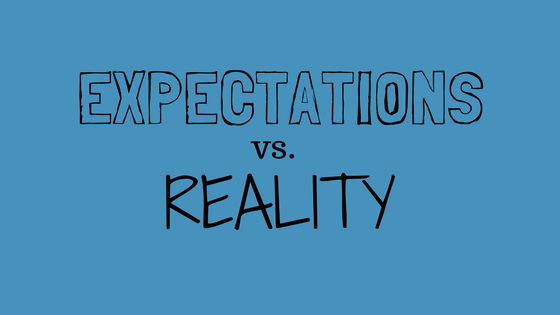 If the mismatch of expectations and reality is what fuels discontent, and we can’t actually control (at least some aspects of) reality, why not focus on expectations? Those ARE within our sphere of control. Since we can’t always predict or predestine events, trying to match expectations to the unknown future is a gamble, and I, for one, am not willing to bet my happiness like that. If we let go of expectations (or don’t make them in the first place), then we are free to experience things as they happen. While not every moment will be an enjoyable one that we’d like to have continue or repeat, our overall happiness level is less impacted. Challenge: Practice embracing some uncertainty. Try to enter into some experiences without imagining or planning how it’s going to go. Try to catch and erase your expectations about someone else before you interact. Let go of those shoulds. Can you imagine what it might feel like for you and your loved ones if we all let go of expectations and worked toward fully accepting each other and ourselves for who and what we actually are? Challenge: The next time you find yourself angry with someone, buddy check yourself. Did they really do anything wrong, or did they just not meet your expectations? And the next time you find yourself apologizing, ask yourself the same thing. To a certain extent, I believe that we all set expectations. It’s one of those short cuts that allow our brains to process so much information so quickly and to keep us safe. If I expect that running across the interstate may result in me getting hit by a car, I may take precautions. So often, though, we make so many internal demands that we essentially hold the future hostage. Meet our demands or else! The saying “It is what it is” sounds like a vague platitude, but it’s more profound than you may realize. It is the essence of letting go of expectations, of meeting each moment as it comes, making room for and accepting the ups and downs of life, It is at the core of being mindful and a key for facilitating your own happiness. I expect that you’ll agree.